How would you comment on the words of Kramnik, who said that Anand is the better player, but that you’re the favourite because of playing in Sofia? – Don’t forget that he was saved by the match being on Russian territory in Elista. There the organizers managed to hide his tracks. They didn’t show video footage which clearly showed his behaviour. He doesn’t behave like a man. A man with dignity and who believes in his honesty would seek out and show the records himself. His opinion does not reflect the views of the entire Russian chess community. We have excellent relations with most Russian chess players – Karpov and FIDE President Kirsan Ilyumzhinov will come to Sofia. The International Federation has repeatedly said that the protest of my delegation was correct. What he says is another matter. 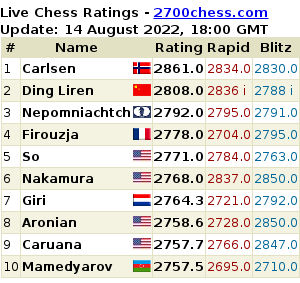 Kramnik managed to play several matches for the world title because he is Russian. If he was from a small country, no one would give them to him. The Russian Federation and previously the Soviet Union has always had influence. Even in controlling who will be president of FIDE. Kramnik benefited from this and played matches without any cycle. After Elista he was given a new match. Even in Bonn last year I should have played, not him. They almost managed to remove me from the cycle for years to come. This happened to Kasparov because he began to criticize the former president Vladimir Putin. All his troubles in chess came from the world champion not being able to secure a sponsor. Anand refused to play under “Sofia rules”, which was a mistake. […] I said that during the games I will communicate with Anand only through the arbiter, but this is also normal. Perhaps there is an element of psychological warfare.